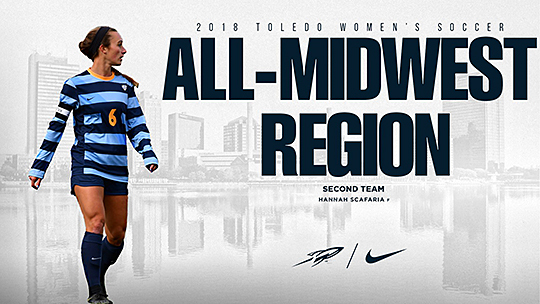 Toledo women’s soccer senior captain Hannah Scafaria was named to the United Soccer Coaches’ NCAA Division-I Women’s All-Midwest Region second team. Scafaria is the second Rocket under Head Coach TJ Buchholz to be named to an All-Midwest Region team, following Isa Echeverri, who was named to the third team in 2016 and 2017. “Hannah had a record-setting season and it is great for her to receive such a prestigious honor from the United Soccer Coaches Association,” Buchholz said. Scafaria joins 14 other athletes on the second team, and is one of 12 student-athletes out of the Mid-American Conference named to one of the United Soccer Coaches’ postseason teams this year. This is Scafaria’s second postseason recognition of the year, having been named to the All-MAC first team in November. Scafaria dominated UT’s offense this season, amassing 14 goals and one assist in 19 matches. Her efforts moved her to third-place all-time at UT for most goals scored in a single season behind Molly Cornwell (2007) and Corrie Hasenjager (2000), who both netted 15. The forward ended the year with the most goals in the conference, two more than Bowling Green’s Erica Hubert. At one point in the season, Scafaria also was ranked second in the nation for total goals and fifth in the country for goals per game. This entry was posted on Thursday, December 6th, 2018 at 3:00 am and is filed under Athletics, News .